Don't let the question predict, limit and/or hide the answer. It is very important when creating a brief for a creative project not to be overly prescriptive as it will limit the possible creative outcomes. Trust the team and the creative process to deliver unexpected results that fill your requirements. When engaging in a new project we want to get the ball rolling quickly, layout expectations early and agree time-scales and budgets. Removing ifs, buts and maybes from the process greatly increases the chances of the creative partnership surpassing the client's expectations and the development of a lasting relationship. This part of the work plan is dependent on both the brief and the scope of the programme. Production can be explained in isolation but is executed with Planning. I have updated the previous post "Plan" to reflect some of this. Take risks, be persistent, be curious. Fail early and fail often. Using the inspirations that were collected in phase one, the team offer up ideas that address the needs of the brief. Team members can offer up fresh concepts or build on the work of others. This is a heads up exercise were we keep looking at the work of those around us and the inspiration gathered earlier in order to spawn more ideas. Encourage the things we like, use language that explores/broadens rather then directs/narrows. How much is enough? A team of 4-5 should be able to easily produce 100+ concepts in less then an hour. Teams may loose energy very early less then 10 concepts in the process. Feeling that the "right answer" has been found already and that time is being wasted that could be used on production. This is quite natural amongst groups new to this type of process, or jaded by prior experience. At this point the facilitator needs to come forward and step the group up and down the brief asking exploring questions. Open up the team to new process of exploration. Encourage, don't dismiss or correct unless all other options have been explored. These sources should not always be digital and the internet is only one source of great material. Books, journals and magazines have the advantage and disadvantage of being curated content which can save time and energy initially. They are also dated time capsules making it easier to spot trends both past and present. These sources are triggers for thoughts, memories, conversations, from which a thousand ideas can grow. It is important that we check our filters when viewing sources and make sure that we are not unknowingly editing out source material without being daft and letting everything in regardless of relevance. Get out and experience the real world, be empathetic, meet the people who may ultimately interact with the product of the brief. Explore the environment which will be effected by the product. Take pictures, videos and notes, try to understand the human needs of the design process be an anthropologist. Understand the who and where before addressing the what, why or when. Is the brief something completely revolutionary or are their other product/services already available that are close to or already fulfil the requirement of the brief. If so what are they? What can we learn from them? How are they performing? What are their strengths and weaknesses? Should we stand on the shoulders of giants? What would a completely new offering look, sound, taste, smell or feel like? Inspirations should be shared visibly and openly with the group. Avoid any urge to protect or hide good sources for personal gain, thinking they might come in handy later. Instead look around at the inspirations added by the team and bounce off them in order to build on their influence. Acknowledge and encourage the ideas you like, refrain from criticism or discouragement at any stage. Talk openly with each other throughout the process, rather then work silently in corners. The second step of the Inspire phase is to organize the insights developed by the team. 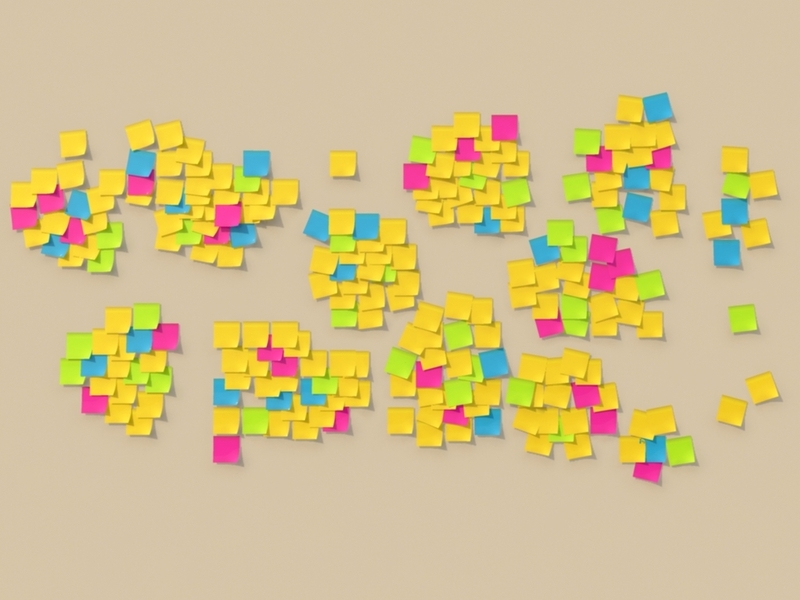 Each Postit is moved individually and discussed by the team as it is placed beside notes to which it has something in common. As each note is organised whitespace is created and the clusters/themes become clearly defined. Each team is then asked to develop a narrative to describe and establish the relationships, if any there is between each clusters/theme. Complex problems require simple, clear and honest solutions. Successful solutions will move people by satisfying their needs, giving meaning to their lives and raising their hopes and expectations. Exceptional problems demand exceptional solutions that may be radical and even disruptive. Effective solutions will be collaborative, inclusive and developed with the people who use them. No solution should be developed or delivered in isolation but should instead recognise the social, physical and information systems it is part of. Every solution needs to be a robust, responsible and designed with regard to its long-term impact the environment and society. Run correctly this creative process will bring out desired behaviours in the individuals taking part. These behaviours will initially be reactions against the process, aggressively defending the way they have been taught to think since childhood. Support and encouragement from the facilitators, rather than correction will allow the participants to see the benefit and strengths of the new process and will quickly engage at a higher level. As each phase of the creative process comes to an end and the next one begins, participants will instantly revert to their prior learned behaviour and will need to be pulled back into team centred, divergent thinking. Allow mini cycles of divergent—convergent thinking in the initial stages as the participants get comfortable but steer them away from reliance over time. Contrary to common educational practice, students learn from what they experience and not from what they are told. Facilitators/Managers of the process need to stay focused on the bigger picture and not allow themselves to get stuck in details that may seem important in the moment but run against the overall experience of the participant. Consistency across the whole delivery team is vital and gives the participants clear indications of what they boundaries are. In instances where specific learning outcomes need to be met, care will need to be taken in the correct construction of the brief so they are achieved naturally. Telling participants what the learning outcomes are before or during the process will prevent them from embracing the creative process and developing truly innovative work. Creativity and innovation is only successful if the environment supports it. Cultural and personal conditioning needs to be acknowledged early. If the company, institution, course or session doesn’t adapt to the needs of the processes of innovation and the creative individual neither will exist in any meaningful way. Facilitators/managers supply the environment and tools required, but need to trust those involved and the process to deliver unexpected results. Contributions by those overseeing the sessions only guide the process and avoid contribution or deliberate steering. The physical environment in which the creative process takes place is very flexible and often takes many forms. What is vital is that the space provided is allowed be covered from head to toe in the inspirations, illustrations diagrams etc. gathered during the each of the creative process phases described below. Where clear walls are not available, painted 8x4 MDF boards should be made available. A team of four participants would be expected to fill between 4 & 6 of these boards in the development of their brief. Supplies should be freely available and plentiful. Sharpies, Letraset TRIO or Pro markers, Postits of all shapes colours and sizes, plasticine, glue and coloured paper; including white. Before work can begin with a new creative team or group of teams it is important that some ground rules are established and very clearly and consistently enforced (enforced may seem harsh, but clear boundaries are not a bad thing). The initial success of project flowing through the creative process is influenced heavily by culture. Culture can be of any scale, department, organization, region, country and needs to be considered and adjusted for. Not all people/peoples are preconditioned to finding solutions, opportunities or problems worth exploring. Not all people are hardwired to be difficult but some are, find a way around them. If you have to take them head on, play to win but don't make a hero out of them. Are similar in nature to association methods where completely new unexpected ideas are generated. However this method Enforces new ideas to fit the profile of the problem. There are many techniques that can be adopted within this method. The 3 component model for creativity applies to all methods. Facilitation of the creative process runs in two very distinct streams. One experienced by the Facilitation/Management team and the other experience is that of the creative participants. It is important that the creative participant stream is completely insulated from the bumps and glitches within the Facilitator/Management stream and that they experience a cleanly run machine within which they feel the confidence to express themselves openly. Where the scheduled goals met? How was our individual performance and as a team? Creative participant performance, are their any problem individuals who need greater stimulus? These meetings are not recorded, they are informal and purely to maintain the quality of the programme. Less than 45 minute, Facilitators/Management minuted meetings, which occur weekly in long programmes or at the end of short programmes. These meetings are designed to capture a review of the week/programme based on the questions above while it is still fresh. Capturing feedback from the participants throughout the process is vital to the success of future delivery. Questionnaires should be designed carefully so they inform the process rather than purely please the priorities of the delivery team, institution or funding body. Are group-based activities, which can be used to a lesser extent by the individual. They have no boundaries and rely on spontaneous reaction and Quantity of ideas. As the name suggests they deal with ideas associated with the problem (Near and Far association) Creativity within Association methods,as mentioned above relies on a process which must be spontaneous in its nature in order to generate as many ideas as possible. This process is a collective of different processes encapsulated by the familiar title Brainstorming. For all methods a general guideline exists known as The 3 component model for creativity . Brainstorming is the general collective term for the processes of creative thinking for associations. It can have its place anywhere in the creative process but is most effective in the initial phases. It is possible to brainstorm on an individual basis, this is a method often used by designers whilst working on sketch pads. This is a very quick and effective method of generating a large amount of ideas. Six participants individually write down three ideas on a specific proposed problem, within a set time (approximately 5 minutes). These ideas are then passed around five times and each participant adds another 3 ideas. This generates 108 ideas (6 x 3 x 6). The one rule, however, is that it must be remembered that this is an association method where the association is relative to the particular list that is held at a given time. These methods work best with a matrix chart to ensre all ideas are collected. Group activity This is a secondary level process. The Problem, or Design Brief is explained to the group In silence each individual jots down their ideas on a sheet of paper ( in either written or sketch format ). When an individual has created 4 ideas or has a mental block, the paper is placed in the centre of the table. They then select a sheet from the centre of the table and try to add more ideas to it. Each sheet is anonymous and the same sheet could be selected several times. 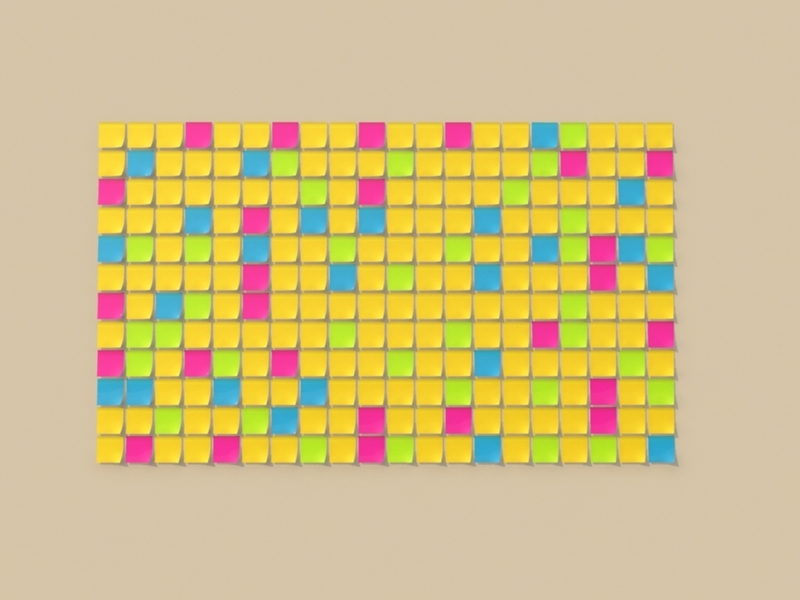 This can be more effective than normal brainstorming. Other ingredient, material, processes, power, place, approach, tone of voice? Create a blend, an alloy, an assortment, an ensemble? Combine units, appeals, ideas, purposes? What else is like this? What other idea does this suggest? Does the past offer a parallel? New ways to use as is? Reverse roles, change shoes, turn tables, turn the other cheek? The fishbone diagram is a method of clarifying a problem. The technique best works with problems which start with terms like What, Why and How. This list is indicative and not exhaustive. The categories are used to stimulate brainstorming around the causes under each. At the end of the process the problem is more clearly defined. Use the associations from no.4. to create solutions to the problem. 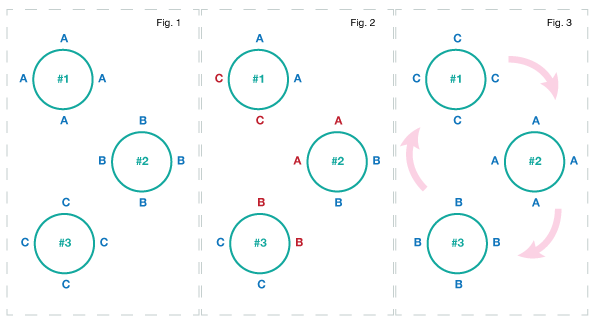 The principal of this technique is by using the problem analysis as the central theme, ever widening circles or "petals" are created with related ideas, which themselves become central themes and so on. Find eight ideas related to this and place them concentric to it. Select each of these ideas A-H individually and create other concentric diagrams for which eight further ideas are created, relative only to each individual idea. Knowledge and facts with technical and subject relevant skill bas i.e. The experience of creativity process and application of a proper work style i.e. Are based on analysis and systematic description of a problem. The collation of inventory solutions, variants to sub-problems and the analysis of combining these ideas to achieve the best solution. This method is regarded as a systematic method, because its nature is to step by step solve problems before grouping them together again to create an overall solution. It is also regarded as analytic because various problems are solved by creating comparisons with analogue problems. What is the new product to do and how could it do this? It is a method that allows a designer to take a “Blue sky project” and create a brief that is much more manageable and focussed. It's an energy saver of sorts.